JOURNEYS THROUGH TIME: Travels With My Aunt - Part Two - Illegal Aliens! Travels With My Aunt - Part Two - Illegal Aliens! Having now missed the return ferry home (refer to previous post) there was nothing for us five weary travellers to do but find something to occupy the long twelve hour wait until 3.00am the following morning! For some reason the song "The Day We Went To Bangor" sprang to mind and I immediately suggested it should be our next port of call. There was a great hullabaloo at the train station with dear Aunty E insisting she buy all our train tickets. Always a woman to be easily parted from her money, under the influence, she became a philanthropist. In the end, common sense prevailed and Aunty E's hard earned cash remained untouched, safe within its leather pouch. Now, with tickets secured, we waited for our train to Bangor, of course not having a clue what we were going to do there once we'd arrived! A couple of railway staff enquired if they could be of help and when we told them what had happened they laughed, telling us that we were now illegal aliens! With that, my friend's mother produced the bottle of brandy which she'd purchased on the ferry solely for home consumption and I, wishing to bring a sense of decorum to the proceedings, headed out to procure some polystyrene cups. Needless to say I did not partake of the liquid refreshment because by then the little man with his hammer had begun to pound quite loudly against my skull. Our train arrived and off we set to our unknown destination. I can't recall the journey time but I know we were much relieved to find a cinema where we could rest our weary bones and allow the two senior members of our group to hopefully sleep off their excesses. The film showing was "Grease" and although most of us had already seen it, it nonetheless provided an excellent excuse to while away a couple of hours watching John and Olivia strutt their stuff. After a while the two ladies fell fast asleep as we thought they might. Of the whole day's adventure this is the part I remember and treasure the most. During a very quiet moment in the film Aunty E woke up and enquired loudly in a very drunken tone "do you have the cabbage in for tomorrow's dinner?". I thought I'd die. Everyone turned around, I was mortified! I hastily answered "yes" and told her to go back to sleep which she promptly did. I don't think we stopped laughing for the remainder of the film! Later in the afternoon we ate in a cafe, did some window shopping then headed back to the ferry terminal to wait and even dozed for a few hours until our ship arrived in at 3.00am. As I'd always wanted to see sunrise at sea, at around 5.00am while most people were asleep, I went up on deck. What a sight met my eyes - in the centre of the stillness shone a pale yellow sun streaked with sleepy dark cloud, its light reflected on the vast stretch of water which lay out all around me. It was worth missing our earlier ferry for. We docked at around 6.30am, exhausted but very glad we got to extend our adventure. Our hubbies waited on the quayside to transport us to our respective abodes and yes, they laughed but we were beyond retaliating. I survived the car journey home only through the constant image in my mind's eye of my cosy bed and the several hours of blissful sleep which lay before me. All in all, a grand day (and night) out! 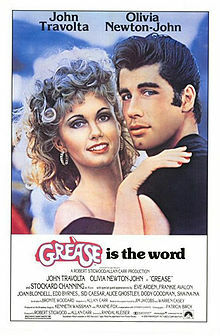 "Grease" film poster image via Wiki.